The morning dawned on May 31, 1982. My heart was so full of agony, sadness, and just plain heavy with hurt. I would give birth to my baby today and she would be stillborn. How well I knew that feeling. May 2, 1975 I gave birth to my firstborn son, also a stillbirth. Now, here I am again, in the same hospital going through it again. My mind wasn't comprehending how this could happen to me twice! It wasn't fair! I was tired of "making lemonade out of lemons!" Enough already! Oh please, not that raw pain again that just engulfs your entire being! But there was no way of escaping. Dr. A came into my room to explain that this would be a difficult labor and birth. Since my baby's heart had stopped beating at between 4 to 5 months along, he said most times these babies don't want to let go. Thus the mother's body has to work more intensely to deliver. Well, this scared me! My other deliveries had been no picnic. I prepared myself mentally, phsically and spiritually for what was about to happen. I just concentrated on Jesus nailed to the cross to bear my pain for me. I knew I could not get through this without Jesus with me. The nurse came in with the pills for me to take. I swallowed them down with hard gulps. These were the pills that would rip my baby from my body. I felt my belly and its roundness. I felt my baby inside me trying to memorize the feeling. I knew my time with her was precious and few. Labor began shortly. The pains came sharp, but I just kept the image of Jesus in my mind as my pain reliever. I just couldn't believe I was going through this nightmare again! Giving birth to a dead baby is an extremely horrible experience, but going through it twice was just unthinkable. My doctor told me after the first stillbirth seven years ago that this would never happen to me again. I believed him. Don't ever say never! You just didn't hear about these types of births much at all. Twice to one mother was just unheard of. I didn't understand at all why this was happening to me. The pains came in waves, shaking my very being. I just kept that image of Christ for me to focus on. I KNOW it helped with the pain because it never got as bad as the doctor had described to me. All of a sudden, I felt the urge to push. This was much sooner than anyone had expected. No! I don't want her out! I don't want to push my baby out of me because then she will be gone from me! I was hurried to the delivery room where my daughter was soon delivered. I had known the entire time that this child of mine would be a girl! I had a daughter! We had conceived a daughter after all of this time! She was handed over to me to hold for just a few seconds before it came time for the afterbirth to be delivered. All of a sudden I felt like all hell had come down on me. The pain! The afterbirth wasn't coming! Without any noticed for me to prepare with a cleansing breath or anything, Dr. A just went in to get it with his hands! I felt like I was being ripped apart! I screamed with all of my might and grabbed his arms to pull them out of me. Once again, my hands were restrained by nurses. I didn't have time to catch my breath. He just kept right on pulling. Suddenly he stopped. He said he got " most of it" leaving me with a D&C to have the next morning. Next, he and the nurses started massaging my belly to try one more time to get it to release. Oh how that hurt! Please just stop it! Do the D&C and leave me alone! They stopped because it wasn't working. I was cleaned up and carried back to my room. James came in. His mother was there also. The nicest nurse came in carrying our precious baby girl wrapped in a little blanket. The nurse put her in my arms as she told me how beautiful our baby was. The nurse told is she weighed 1 lb and 4 oz. Our daughter was just so tiny, but was perfectly formed and made. 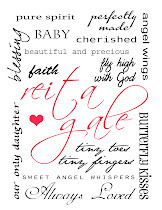 We both knew already that her name would be Reita Gale Fitts. 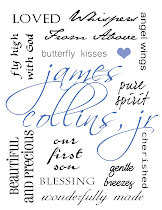 James had given our firstborn son the only gift he could offer, his name. I gave our only daughter now, the only gift I coud give her, my name, Reita Gale. She had died from another cord accident. Right where the cord met her abdomen, it had been pinched tight due to her moving round and round. I had more umbilical problems than I even knew were possible. She had ten tiny toes and ten tiny fingers perfectly formed. Everything about her was perfect, except the cord. Her face was not like James Collins, Jr's though. He had a peaceful expression when he was born. Reita Gale did not. Her face had a very painful expression which saddened us to know end. She had suffered. She had known pain. You could just tell that without a doubt. Poor baby. She had suffered, but was no longer in pain. Her spirit had left already for Heaven. She was with her brother in God's arms. She was my 2nd angel baby. And I cried as I held her. I wrapped her finger around mine. It was so tiny. Her head had fuzz for hair. Her eyes were shut as James, Jr's had been, but I already knew they were blue. My two rainbows sons have beautiful blue eyes, so hers had to be also. Wow, she had three older brothers to look after her...one in Heaven and two on earth. What a great time she would have had with two older brothers making over her and protecting her here on earth. That was not to be and that saddened me immensely. I had always wanted two boys and then a girl, so the boys could take care of her during her high school years. So many things we were now going to miss. Her first steps. Her first boyfriend. Her wedding. Her children. Spoiling her. James just wept for his daughter. I did too as my heart was beating heavily with pain. It is a pain so intense that you can try to describe it, but never do it justice. My heart was just so heavy and I felt the grief aging me beyond my 31 years. Who is to say what is fair or not? I didn't matter. Fair or not, I was holding my dead baby daughter who was wanted beyond words. I was trying to take a lifetime with her in with me during the short time we were given with her in my room. Did I tell you that she had little fingernails and toe nails? Her nose was so cute. I kissed her. We had not thought of bringing a camera to take her picture. I wanted pictures of me kissing her and her finger wrapped on mine and her daddy's. Then it was over. Too quickly the nurse took her away. She was gone. I would never see her again. I was numb with grief already. James left as I was going to rest. It had been a very hard morning to say the least. His mother stayed a short while after he left. I closed my eyes, but could not sleep. My only daughter had died. I knew I would grieve for her forever. As I layed resting the nurse told my MIL she was sorry for the loss of her granddaughter. My MIL told the nurse that she already had a granddaughter that took up all of her time. She told the nurse that she really didn't have the time for another one. My eyes were closed, but I could just imagine the shocked look on the nurses face. As I layed there quietly, my insides were ripped out once more to hear from her own lips in her own voice that she didn't really have time for my baby girl. I have never ever been so hurt by that woman. Did she even understand what she was saying about her own granddaughter? My daughter had just died and she really didn't care. She left. I was left alone in my room to rest. Right! How does a mother who has just given birth to her dead child rest? She doesn't. She cries her eyes and heart out! Suddenly I sat up in my bed, reached for the telephone and called the funeral home to plan my own daughter's funeral. With my son, she planned it and I didn't get to go! I wasn't going to let that happen again! This time things were going to be different. I would not only plan her funeral, but I would also not be left behind! I planned the date to be June 3, 1982. This would give me time to have the D&C and still be home to help with everything. I called James and we discussed the funeral plans I had made thus far. He promised to do the rest, right down to the flowers I requested. He agreed with me that no one would attend the graveside services but us and our two sons. We told no one of the funeral. He called our church minister and the associate minister to give the service. It would be at 11:00 because I love the morning time. As it turned out, my doctor decided I didn't need the D&C after all. I questioned this call as I wanted to try again for another pregnancy and I knew the best way to get back on schedule would be to have the D&C. He wouldn't do it. So, on June 1, 1982 I left the hospital for the second time with empty aching arms. I should be holding my daughter all dressed up in pink and white. It was even harder this time than the first. I think it was just the sheer disbelief that it was happening again. The silent ride home was deafening. How would we explain this to Collins & Taylor? Gale, so many feeling rushing back to me as this reminds me of losing my baby girl! Reita weighed only 2 ozs more than Kaylea. She was 1lb 2ozs! She was beautiful as I'm sure Reita was as well! I just want to hug you!! And I forgot to comment about the MIL. Let me just say WOW how can someone be so heartless!? And say she was too busy for another granddaughter! I know you and her reconciled later on but you are more of a woman than I am to forgive that kind of behavior! It's unacceptable! 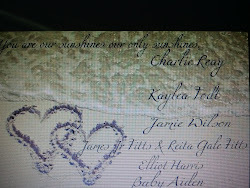 I love you, sweet Gale, and our angel girls and boys play together amongst the clouds waiting on us! FLASHBACKS all coming to me. I remember that day when we went to the funeral homes a day after I delivered and lost Alanna. The lady from the Funeral Homes was asking us what we want, dates, caskets, number of people attending and urns. It was so painful to decide and to even answer the questions but I tried so hard to hold my tears.